About a month ago we shared the recommended PC specs for The Division 2. Now, as we march closer to release, we have news of an Open Beta being prepared. In an announcement on its news blog, Ubisoft says that the open beta will run from Friday 1st to Monday 4th March. 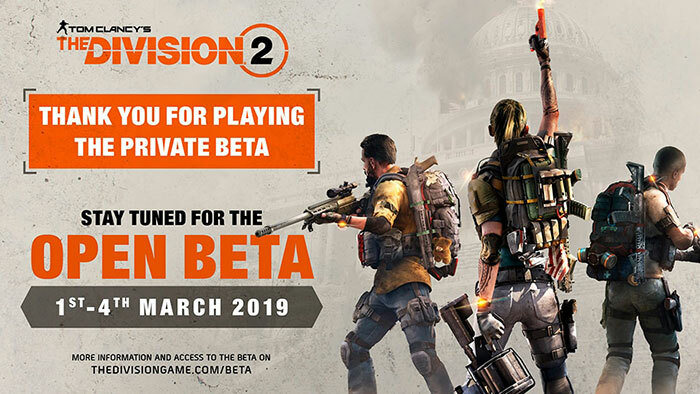 The Division 2 Open Beta will be available on all launch platforms (PC, Xbox One, and PS4) during the same long weekend. Ubisoft has already completed a private beta test and it hopes that players of the open beta will also contribute to the feedback, bug reports and suggestions. Another bonus of such an open beta will be that it could stoke-up wider interest in the full finished game which is scheduled for release just a fortnight later. If you have shown any interest in The Division 2 previously, you will know that it is a story of US citizens struggling to return the country to order after a deadly virus outbreak. The first title was set in a wintery New York, with this second outing contrasting that environment with a summery Washington DC. 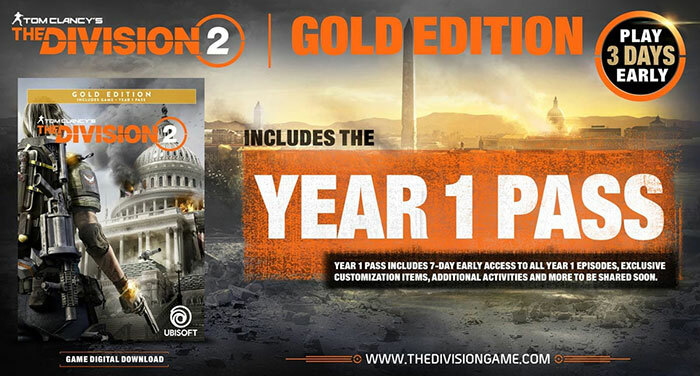 On the official game info page, Ubisoft crows that "Unlike anything before it, The Division 2's Washington D.C. is a 1:1 representation of the real city, making the game world more authentic than ever". In the game you will be one of an elite group of civilian agents using advanced weapons and unique skills to "Save DC". Factions you will come up against include the True Sons, Hyenas, Outcasts, and Black Tusks - all vying for power in the governmental / societal vacuum. The open beta will give you opportunity to try out the gameplay available and modes such as co-op, PvP, and more. Ubisoft says it has learned a lot from the development of the original The Division. The new game will deliver more content out of the gate, with a "substantial campaign that organically flows into a robust endgame". The Division 2 release date is Friday, 15th March. Standard, Gold, Ultimate, Dark Zone Collector's and Phoenix Shield Collector's editions are now pre-orderable. You can buy this game for your PC, Xbox One or PS4. On the PC the digital version can be had via the Ubisoft Store or Epic Games Store (no Steam). I tired the private beta last weekend and it felt mostly like the first one (which is good in some ways) but the performance was horrible and the frame rates were unplayable at times even with the same settings I was playing the first one in. Drivers are really going to have to help out as at this stage I don't think they will be doing anything more to the game engine. I thought this was an AMD game though as they are bundling it with their gfx cards? The game is better than I expected. Will be looking forward to play it although it's a shame the there is no crossplay - I would have loved to have gotten this game on the PC as opposed to the PS4 where all my friends will be playing!